Everton have completed the signing of Theo Walcott from Arsenal in a deal reportedly worth £20million. The England international was also linked with West Ham and former club Southampton, but will instead attempt to revitalise his career at Everton, signing a three-and-a-half-year deal at Goodison Park after falling out of favour at Arsenal. Walcott made almost 400 appearances for Arsenal, scoring 108 goals, but his first-team opportunities shrivelled up this term and he has played just 47 minutes in six Premier League substitute appearances. He becomes Everton's second signing of the January transfer window, after the Toffees signed striker Cenk Tosun from Besiktas. Walcott will add pace to a stale Everton attack that has gone six games without a win in all competitions under Sam Allardyce, scoring only two goals in that sequence. And the versatile attacker explained the potential growth of Everton - who are planning a move to a new stadium - encouraged him to make the switch from Arsenal. 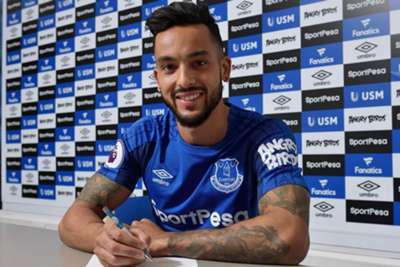 "I'm very ambitious and I've come here because I want the club to push to the next level," Walcott told Everton's website. "And with the players that have come in, I feel like the next level can be reached. "I'm very excited to be starting a new chapter and I felt this was the right place for me to be. The manager is very ambitious and I feel like the club is going in the right direction. "Everton is a club with a great history. The fans are always passionate, they're great and I always used to find it very tough playing here. "The club has won trophies but I want them to win trophies now. The manager is very hungry and it's just what I need. I've had a couple of chats with him and straightaway I felt that hunger and that desire that he wanted from me. I need that and I wanted that." Arsenal are reportedly preparing to invest the money recouped from Walcott's sale into a January pursuit of Borussia Dortmund star Pierre-Emerick Aubameyang.